To coincide with the release of a box set comprising all of The Wedding Present's sessions for John Peel [more news of this soon] the band have confirmed that they will be playing two concerts next year in David's home county of Yorkshire. Please check the tours page for details. 'Drive', a new feature music documentary featuring The Wedding Present, will receive its world premiere this Thursday, 7 December 2006, at 7:00 pm in the Bridgette Mayer Gallery, 709 Walnut Street, Philadelphia, PA., USA. Filmmaker Steve Stone and his crew chronicled The Wedding Present's North American tour of 2005, travelling alongside the band for eight of their 26 dates in an effort to capture the essence and intensity of their live shows. The resulting film incorporates comprehensive live footage of the band as well as interviews and candid, often comical on-the-road and behind-the-scenes material. There will be a reception for this event taking place from 7:00-7:45 with food and beverage. The film presentation will take place from 7:45 -9:00 pm and there will be a Q+A session for those interested immediately following the film. The Wedding Present have confirmed their final set of tour dates for the year and foreseeable future. The concerts will be in France, Spain and Wolverhampton in the UK and are listed on the tour page of this web site. Following the success of our first 'silent auction', Scopitones is now offering some of David Gedge's Wedding Present and Cinerama 12 inch singles and LPs up for sale. A percentage of the proceeds will go to The Streets Ahead Children's Centre Association. For full details of how to take part in this auction please visit the 'forum' section of the Scopitones web site and click on 'General'. You can also have a look at the list in the 'blog' section of our MySpace page (www.myspace.com/theweddingpresent). Following the release of the most recent album, TAKE FOUNTAIN, The Wedding Present embarked on what was to be their longest tour ever. The band started in Belfast on 16/02/05 and finished in Exeter on 12/07/06 after playing 172 concerts in 20 countries. To commemorate this, the band have decided to release the first ever official Wedding Present T-shirt to feature tour dates. The shirt is dark blue in colour with a white print of the stick figures logo on the front. The entire list of tour dates is printed on the back of the shirt [with the exception of Sevilla in Spain which was sadly omitted by mistake!] This shirt is on sale now from the merchandise section of this site. In an effort to reduce the clutter in his office David Gedge wants to reduce the size of his personal Wedding Present CD collection, so Scopitones have decided to offer some of the more rare and interesting recordings up for sale by silent auction. A percentage of the proceeds will go to The Streets Ahead Children's Centre Association. For full details of how to take part in this auction please visit the 'forum' section of this site and click on 'General'. Following their recent Summer 06 mini-tour The Wedding Present recorded two sessions for BBC Radio in London. The first was for Tom Robinson's BBC 6Music show on 13/07/06 where three songs, "Wow", "Mars Sparkles Down On Me" and "Niagara" were performed live on air. On 19/07/06 they went on to record a further four tracks at the BBC's famous Maida Vale Studios for the One Music programme on Radio 1. The tracks on the second session are all cover versions and will be transmitted during Huw Stephen's show from 11PM on 29/08/06. British radio station XFM have released a World Cup single which features some guitar playing by David Gedge. Profits from sales of the recording, which is out now as a download and 7 inch single, will go Shelter, the homeless charity. Four new dates have been announced for concerts in the UK. Further details are on the tours page. The Wedding Present's Warsaw concert on 10 May 2006 has been cancelled due to circumstances beyond their control. The band would like to apologise for any inconvenience caused. The Wedding Present will be releasing "Search for Paradise: Singles 2004-5" in May. The CD of this double disc collection features the A-sides of the three singles from last year's critically-acclaimed "Take Fountain" album together with all the B-sides plus previously unreleased acoustic versions of the A-sides. The DVD contains the videos made for the singles and also one for the outstanding album track "Don't Touch That Dial" together with a film made for an acoustic live version of "Perfect Blue" and bonus 'behind the scenes' footage. CD [DISC ONE] - The A-sides: Interstate 5, I'm From Further North Than You, Ringway To Seatac. The B-sides [previously unreleased outside the UK]: Bad Thing, Snapshots, Rekindling, The Girl With The Curious Smile, Nickels And Dimes, I'm From Further North Than You [Klee Remix], Shivers, American Tan. The Acoustic Versions [previously unreleased anywhere]: Interstate 5, I'm From Further North Than You, Ringway To Seatac. DVD [DISC TWO] - Promotional videos of: Interstate 5, I'm From Further North Than You, Ringway To Seatac, Don't Touch That Dial. Perfect Blue [Three Minute Film]. Behind The Scenes. Tickets for The Wedding Present's forthcoming European Tour are selling fast. The band will be playing in The United Kingdom, The Republic Of Ireland, The Netherlands, Belgium, Luxembourg, Germany, Poland, The Czech Republic, Austria, Switzerland, France and Iceland throughout May and into June. Please visit the tour page of www.scopitones.co.uk for the complete listings and also the names of all the support bands, who include: The Victorian English Gentlemen's Club [pictured], Scarling, Decoration and ex-Chameleon Mark Burgess. David will be a guest on BBC 6Music's 'Round Table' Show at 6pm on Friday 21 April, where he'll once again be reviewing new releases. [www.bbc.co.uk/6music/shows/roundtable]. The Wedding Present's Grenoble concert on May 20th will now be at Les Abattoirs in Bourgoin Jallieu rather than Le Ciel. The band would like to apologise for any inconvenience that this may have caused. 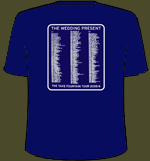 Please visit the tour page of this site for full details of The Wedding Present's forthcoming shows. The Wedding Present's recent in-studio performance at Seattle's KEXP radio station has been archived on kexp.org. As The Wedding Present's current tour of North America enters it's final stages, another date has been added to the European tour which starts next month. The new addition is Reykjavik which means that the band will now be playing for the first time ever in three countries: Iceland, Poland and Luxembourg. Please visit the tour page of this site for full details. There have been some changes and additions to The Wedding Present's Spring tour. The band's first European appearance of 2006 will now be at The South Pop Festival in Seville, Spain, on April 8th. Meanwhile, the band's debut appearance in Luxembourg will now be on May 3rd [and not the 4th] and at a different venue to the one originally announced, while the Opwijk show is on the 4th [not the 3rd]. Extra dates in Switzerland, Ireland & The United Kingdom have also now been added and confirmed. Please visit the tour page for more details. The Wedding Present are pleased to announce that, following their return from North America, they will be playing in The Netherlands, Belgium, Germany, Poland, The Czech Republic, Austria, Switzerland and France in May. It's usually our policy to wait until the entire tour is confirmed before making such an announcement, but we know that some people like to arrange travel plans weeks in advance. Therefore, please note that some of the dates listed on our 'tours' page are yet to be confirmed [TBC]. One-off concerts are also being discussed for Iceland and Spain in April as well as a tour of The British Isles starting in Southampton on May 28 and ending in London on June 8. First and foremost, everyone over here at Scopitones would like to wish everyone out there a very happy and healthy New Year. 2005 was a very busy year for both band and label, and most of us spent the festive season catching up on stuff we've been putting aside throughout 2005 (like sleep!) because of the extensive touring. Having said that we're now all fully rested and looking forward to getting right back out there! There are a couple of things in the pipeline. We're hoping 2006 will see the release of a live DVD and we've been in negotiation with Sanctuary Records here in the UK regarding the release of a complete set of Wedding Present Peel Sessions. More news about these and other Scopitones releases soon. In the meantime, we are pleased to announce that The Wedding Present are about to set off on another short tour of North America. Please see the tour page for full details. Finally, the band are sad to report that, for personal reasons, Simon Cleave will not be taking part in this tour. Chris McConville [who some of you might have met on the last European tour, when he was the sound engineer] will join David Gedge, Terry de Castro and Charlie Layton, all of whom all took part in the final concerts of 2005.